#113 Wedding shoes. 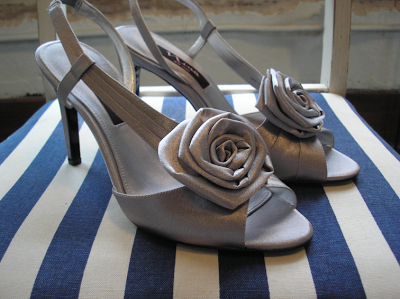 – Laurel Mercantile Co.
Now reading: #113 Wedding shoes. Don’t you just love to find the very thing you’re looking for the moment you walk in the store, then it happens to be on sale? This afternoon we drove to Hattiesburg to find silver shoes for Rebecca’s wedding, and I was preparing myself for the nightmarish situation of finding comfortable shoes in that particular color. The first pair I saw when we walked in the store met ALL the criteria for loveable shoes in my estimation: peep toe, low-ish heel, satin, with a rosette. I love you, Dillard’s Shoe Department.